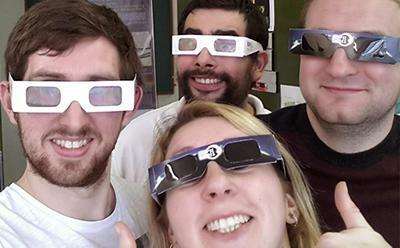 Dr Sadie Jones, Outreach Leader in Astronomy, explains why the solar eclipse has captured the public’s imagination, how to view it safely and how the eclipse reminds us of our place in the Universe. Solar eclipses are cool because they are an astronomical phenomenon that you can see in the daytime! Now, actually, everyone can ‘stargaze’ every day, you don’t need to wait for an eclipse, because the Sun is a ‘star’. However, most people forget this (even if its subconscious) and PLEASE DO NOT LOOK AT THE SUN without your eclipse glasses! So, I think what I am saying, is that the solar eclipse reminds us that the Sun is a star. This eerie darkness we experience during a solar eclipse is because our star has suddenly become obscured by a black disc (the Moon), which just so happens to be exactly the same size as the Sun in the sky. This size thing in itself is very bizarre. By some sheer coincidence the moon is 1/400th the size of the Sun, and the Sun just so happens to be 400 times further away than the moon, therefore they have the same angular size on the sky as seen from our place on the Earth! I think, I can understand why the Sun suddenly going from being very bright to totally black must have driven fear into ancient peoples. The Sun would have been a true constant in their daily lives, constantly giving them light (and hopefully it will continue to be constant for billions of years). Assuming that these ancient people stayed in one location on Earth, they would only see a total eclipse every 360 years - so it really is a once in a lifetime experience, unless you know where on Earth they are happening and can ‘chase' them, this would require use of a plane or boat. When I pondered on this further and asked people on Twitter for their thoughts, I came to the conclusion that watching an eclipse doesn’t just remind you the Sun is a star, it also reminds you that you are part of the solar system and the solar system is three-dimensional. I think most of the time, without realising, we think of the sky above us as some two dimensional blanket of stars, just like how Timone described the ‘sparkly dots up there’ as ‘Fireflies that got stuck up on that bluish-black thing’ in The Lion King. An eclipse (solar or lunar) reminds us that the Sun, Earth and Moon are all spherical objects orbiting each other in a circular dance in three dimensions. They aren’t orbiting each other all in one plane either, the angle of the Moon’s orbit is at five degrees to the plane in which the Earth orbits the Sun (known as the plane of the ecliptic). This means that we do not see eclipses very often (the last total eclipse in the UK was in 1999 and the next one in 2090). Viewing an eclipse reminds us of the bigger system, reminds us that we are part of the vast expanse of space. In fact, we are actually all just passengers on a ball of rock called the Earth hurtling through space at 30 km/s around a perfect sphere of burning hydrogen. Because this eclipse is visible from the UK, it is particularly exciting (and stressful) for me because the BBC Stargazing Live! TV shows have moved from their regular time in January to March to celebrate this. Shows like Stargazing Live are really great for reminding everyone that they can be astronomers. As I said previously, we can all see the sky but sometimes we need to be reminded to look at it. Astronomy can actually be quite thought provoking and therapeutic. Sometimes all of us just need to take a moment and stop what we are doing. Stop rushing about and have a moment of calm, look up and remember that “We are star stuff which has taken its destiny into its own hands” ― Carl Sagan, Cosmos. Everyone can do astronomy and astronomy is happening all the time. You can't do anything about it, it isn't influenced by you or your actions on the Earth, but you can learn about it and try and understand it. So I hope everyone remembers to bring their eclipse glasses, cereal boxes and colanders to work or to school on the morning of Friday 20 March before 9.30am. Happy eclipse viewing everyone but remember to view it safely and don’t look directly at the sun. If you do miss this eclipse then the next total eclipse (which should be easier to see as it goes across so much land) is across the middle states of the USA on 21 August 2017 and the next partial eclipse visible from the UK, which is at more than 80 per cent, is on 12 August 2026.